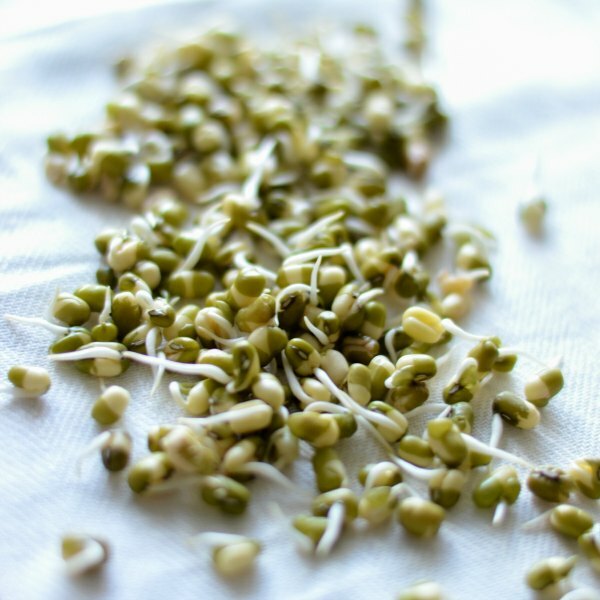 Even though ready made sprouted mung bean is easily available, sprouting mung bean is one of the most easiest things to do at home. One does not need any special equipment to do this. This method works well for mung beans – moong beans. Traditionally they would allow the mung to sprout on a tied muslin cloth. I have even made it simpler by eliminating the cloth method. A simple bowl just works fine. Wash the mung beans in lots of water 2-3 times to get rid of the dirt and dust. 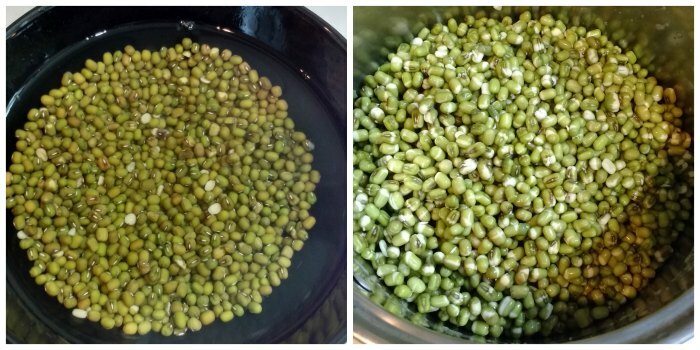 Soak the mung bean in water for 8-10 hours or over night. After 8 hour soak, the bean would have considerably swollen. Drain the beans and rinse the beans. Set aside. Set the drained beans in a bowl and cover it with a lid and set aside in a relatively dark place. I kept it inside a kitchen cupboard. Allow it to germinate for the next 24 hours. After about 24 hours, it will look like this picture below. The bean would have started sprouting vigorously. It might take longer time to germinate if the weather is slightly cold. It will germinate fast in hot and humid conditions. At this stage, use the sprouted bean immediately or store in the refrigerator and use it within the next 2 days. 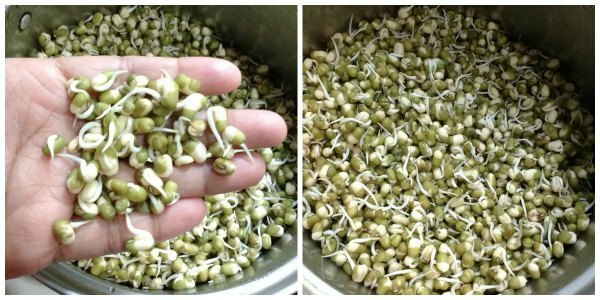 Easy way to sprout mung beans at home. Making sprouted beans is effortless and this recipe is fool proof. Set the drained beans in a bowl and cover it with a lid and set aside in a relatively dark place. I kept it inside a kitchen cupboard. Allow it to germinate for the next 24 hours. After about 24 hours, it will look like this. The bean would have started sprouting vigorously. It might take longer time to germinate if the weather is slightly cold. It will germinate fast in hot and humid conditions. Sometimes even after soaking for 8 hrs i see some of them have not swollen. Am i doing something wrong? Hi Hema, If the place where you live is cold, it will take longer time to sprout. After 12 hours, just wash the mung beans once and keep it for sprouting again.